My daughter, Maegan (age 3) has a thing for snails! She loves them and since last summer she named them. Usually there is one called Minty - that's always her favourite one! It was raining on our school walk so there was an abundance of snails in our front garden as we were leaving to collect Blake. 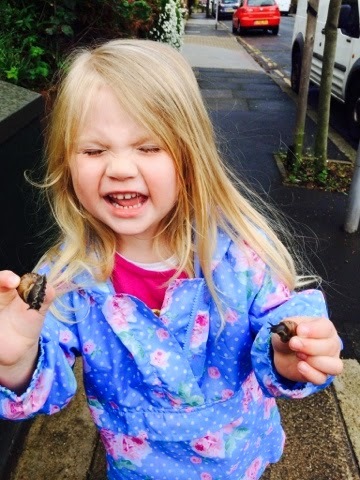 Maegan carefully chose two snails to come on the walk with us - one was Minty and one was called Yonna and she carefully carried them in her hands! Yonna was abandoned on a leaf not far from school but Minty made it all the way to school and back! Maegan liked to tell Minty that she loved her and even kissed her "pet" snail! Minty was returned (completely unharmed!) to her snail family in our front garden.